Last night I dreamed that I was interviewing Oscar the Grouch. But when I woke up, I discovered that it was only a leg cramp that had caused the dream. Do you know how to cure leg cramps? Here’s how. Use an exercise that physical therapists call “The clam shell”. Assuming that this evil cramp is in your right leg, then lie down on your left side, thrust your right hip as far to the left as you can go, bend your right leg half-way, and then move your right knee up to the ceiling and down to the bed or floor a few times — like a clam shell opening and closing. Voila. End of cramp. It’s the sideways motion of your leg that does it. The muscles get confused. They think that they are only spozed to move back and forth, not sideways. And clams got me to thinking about pelicans and all that oil-spill mess in the Gulf. If someone doesn’t contain that spill soon, our oceans could become hopelessly polluted — and if the oceans lose their ability to breath oxygen into the atmosphere and our oceans die, then you and me will probably die too. When our oceans’ inability to process oxygen is combined with our disappearing forests’ inability to process oxygen plus our reduced oxygen levels caused by car exhaust, air travel and war machines, then any fool can tell that we humans will soon be in big trouble — not to mention that nobody seems to notice the huge amounts of totally dangerous nuclear waste we are accumulating, along with enough piles, mounds and masses of plastic Coke bottles generated daily to be seen from the moon if they were all in one place. Am I the only one alive today that notices this stuff? Anyway, after I woke up from the Oscar the Grouch dream, I got to thinking about pelicans. You know, the ones all covered with oil; the ones with the look in their eyes that says, “What happened? What hit me? Help!” And that “greasy-pelican” look could pretty much become ours soon too, in a shorter amount of time than we would like — covered with pollution, wondering what the freak had happened to us and slowly dying. Not only that but there are approximately six billion people on the planet right now and each one of us has added at least one plastic bottle per (week, day, month, check one) to the landfill — or what used to be our farmland. Dig into the ground almost anywhere 20 years from now and you won’t hit oil. You’ll hit plastic. And rusted-out old cars. And toxic chemical sludge. And nuclear waste. Unless something changes drastically in the very near future, in less time than we can imagine, we are all gonna be pelicans too. PS: Actually, the human race does have one saving grace on the horizon — the end of oil. When we are out of oil in a few decades, at least there won’t be so much carbon dioxide released into the atmosphere any more. Who would have thought that being forced to go back to candlelight, horse-drawn buggies, caissons, cavalry and manual typewriters would be just the ticket to save the human race from extinction? PPS: I was listening to progressive radio talk-show host Mike Malloy the other day and some right-winger commented that, “If only Ronald Reagan was alive today, he would have searched for an answer to the oil spill problem — and to all of our other problems too.” Dream on, wingnut. The only answers that Ronald Reagan ever searched for involved looking for newer and better and more corrupt ways to make him and his rich buddies even richer. I’m not sure if I got Mike Malloy’s quote exactly right here or not — because I was too busy cleaning my apartment to take notes. Yes, after all these years I’ve finally found a house-cleaning system that works for me! Every weekday between 6 pm and 8 pm, I listen to Malloy’s radio talk-show on Green 960 AM and clean house. Then I get so angry at all the major Republican neo-con screw-ups he tells us about that I take my anger out on my apartment and actually manage to get stuff cleaned up and/or thrown out. Next I’m going to take on gardening, another task that I hate, and garden from noon to 3 pm every day while listening to Randy Rhodes — taking my anger out on the weeds. Currently every kind of right-winger you can imagine is busy telling me that if only America puts Republicans back in office, then they will clean up America’s mess. Not! Republicans and their various rich-dude allies are the very ones who made most of this freaking mess in the first place — as well as getting all us poor sweet victims of their nefarious plans to be all scrambling at each others’ throats while they, like the Beagle Boys, clean out the mint. It’s like the old “Hair of the dog that bit you” theory I guess — that if we only drink more of the Republican neo-con Kool-Aid that got us drunk in the first place, our hangover from the last batch won’t hurt quite so badly? How naive do they think that we are? If we really want to clean house in Washington, perhaps we should do it while listening to Mike Malloy! BP: Beyond Petroleum – and the Law! 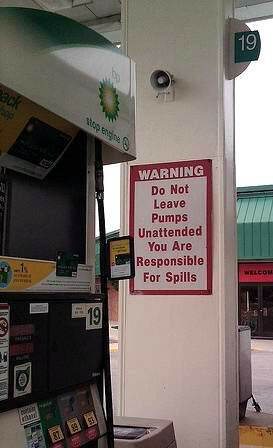 Is BP corporate going to follow its own advice?